If you didn't buy the MTech package with your E92/E93 BMW, then here is your chance to get that aggressive MTech styling without the hefty price tag of the MTech package from the dealership. This MTech E92/E93 front bumper adds a unique type of swag that will give your BMW the ability to turn heads. Being made of durable Polypropylene material and molded using precise measurements, this MTech front bumper will fit just as well as your OEM front bumper. NOTE: Slight trimming or removal of the brake and oil cooler ducts will be necessary to install the E92/E93 MTech Front Bumper. 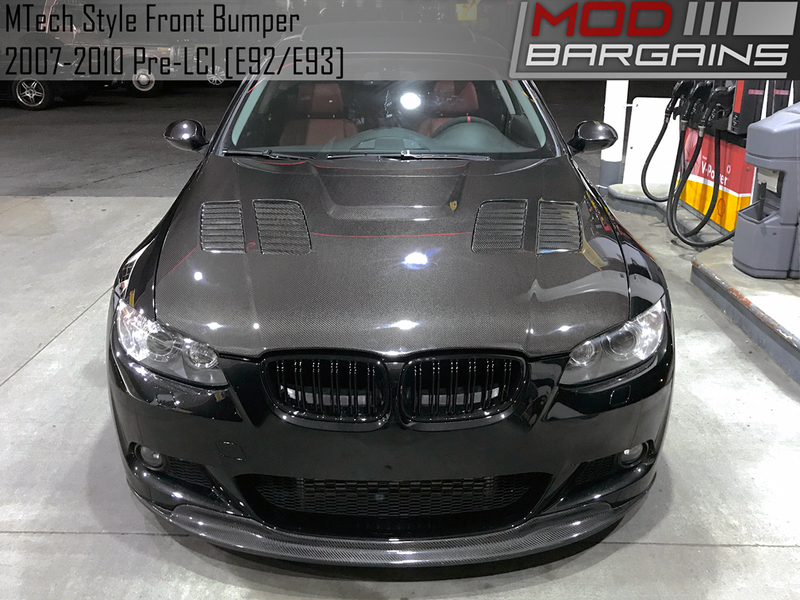 This E92/E93 MTech Front Bumper is made out of Polypropylene a OEM material and includes the grille and fog lights. Best fitting aftermarket E92/E93 MTech style bumper in OEM material. Average Customer Review: 5 Based on 2 Reviews. I had excellent customer support buying my bumper and once it was delivered i was happy to see everything boxed up very well. All of the parts were there and the fitment of the part is spot on. I have purchased from modbargains several times and will continue to. It has been very easy every time and i always get what im looking for. Thanks! This bumper is a great buy! I just recently installed it on my BMW 335i E92. The fitment is perfect and the foglights and mesh grill add an agressive look to the front of the car. Gilbert really helped me get the best deal for BMW parts!